It’s been several years since we posted on this site, but we are ready to jump in again. Check out our new site at www.ayummylife.com. We will cover Burnt Store Marina and much more. 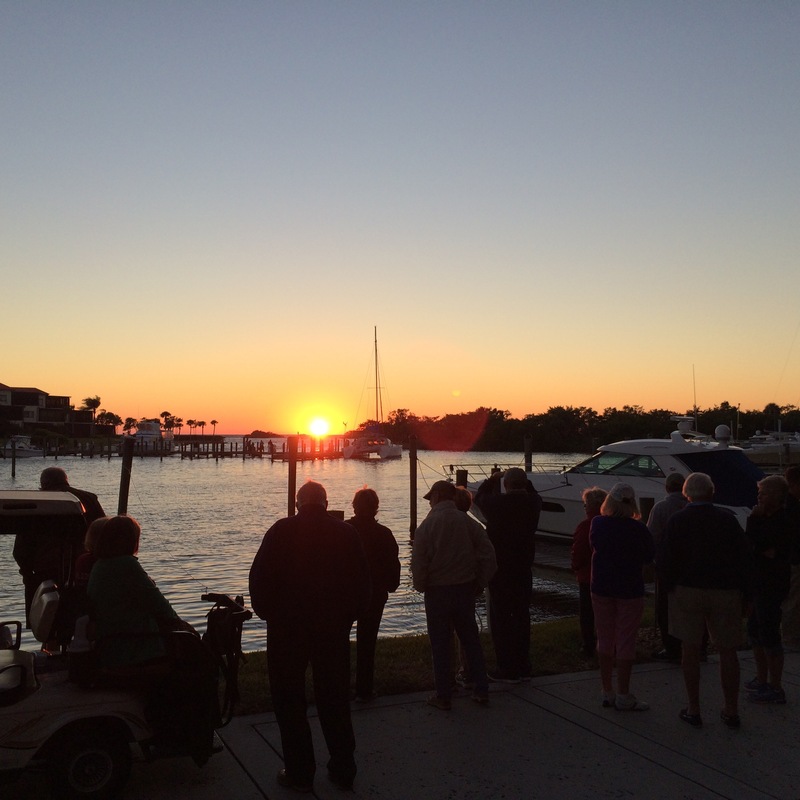 One of the highlights of our trips to BSM is to check out the sunset on the walking path around Prosperity Point. Because the sunset viewing location is so limited, everyone is together and it becomes a social gathering. Each evening, a crowd starts form about 1o minutes or so before sunset, drinks in hand. Our young daughter actually asks to go every night (a nice change from asking to watch the iPad)! Listen for the conch shell horns and you’ll know that you’ve found the right place. Happy Chinese New Year! Want to do something special around BSM? Here are some ideas. As we’ve previously reported, the Ft. Myers area has some great Chinese dim sum restaurants. Dim sum is a great way to try something new because you order small portions that you can usually see before you order them. If you don’t like it, no big deal as each dish is usually only a few dollars. Check it out. And, while you are in that area, visit one of the nicest and cleanest Asian markets we have every seen — Leaf Asian Market. It is on Cleveland Avenue, only a few minutes from the dim sum places, just north of the Colonial underpass. Family run, and will helpfully answer your questions. It is a great, no pressure way to explore the exotic ingredients and try something new. For sure, buy some mochi ice cream! We have been working on the blog, off and on, for almost two years. In 2015, we are making an effort to post more often, and we’ve been successful so far! I would really love to expand our community so that we can share discoveries around BSM. Accordingly, we are going to start promoting the existence of the blog in the community. Our goal has always been to provide a convenient source for residents and visitors to BSM to find the attractions around our community. This is not a commercial site, but exists to share ideas and discoveries, whether those are hikes, restaurants, stores, or other fun activities. So, as a reader, please let your friends know about the site and let us hear your comments. If there are topics you want to see, let us know that as well! The Peace River Wildlife Center is a great way to see birds and other animals up close while they recover from injuries at the Center. The Center is relatively small, but very well done. Although you can see hawks and eagles flying above, it is truly amazing to see them up close. It is a great place for kids as they can ask questions and enjoy the animals in a very low environment. Admission is free, but they do accept donations and have a nice, small gift show on site. It is only about 10 minutes from Fisherman’s Village in Ponce de Leon Park in Punta Gorda, so combining the two makes for a nice morning or afternoon. We love Pine Island! Who doesn’t? The art galleries, interesting characters, and, of course, the seafood markets. Although businesses and owners have come and gone, Andy’s and the Olde Fish House market are consistent, excellent choices. The Olde Fish House has changed over the last couple of years, probably for the betterment of its owners, but we miss its old, sleepy charm. Still a great choice, especially for fried oysters, but no longer a “hidden gem” where you’ll have the place to yourself. They do seem to have lots of live music if you are looking for something to do that is a bit more lively. Andy’s has stayed true to its roots of being, mainly, a great market to buy fresh seafood. But their lunch items, although limited, are fantastic. And they have a few tables, both inside and out by the water. Between the two, we usually opt for Andy’s these days, but we always make at least one stop at Olde Fish House for oysters. What are your thoughts? Are there any other markets that we should try? If you have not yet stopped into Mainly Seafood at Turtle Crossing, just north of BSM, please be sure to do so. At first, it seemed strange to me to buy Maine lobsters and scallops in the heart of Florida. But, after several visits, we look forward to stopping in each trip. The scallops are some of the best we’ve ever had — I love to grill them at home. In addition, you can have a nice, informal lunch and let them do the cooking Overall, a great family run place that we need to support since it is so close to our community.